Indonesia's eastern province of West Papua has been rocked with causing nervous residents to flee their houses in fear days after the tsunami that killed hundreds people in archipelago. Indonesian authorities measured Friday's quake with a 6.1 magnitude and said it was "felt quite strongly" for several seconds. The US Geological Survey gave a 5.8 magnitude measuring. There were no immediate reports of casualties or damage. The region in Papua, which makes up half the island known as New Guinea, is sparsely populated. The epicentre of the quake was on land near the city of Manokwari. "People in Manokwari Selatan felt the tremor for six seconds, causing them to panic and flee out of houses and buildings," Sutopo Purwo Nugroho, spokesperson for the country's national disaster mitigation agency, said. Devastating tsunami On Saturday evening, a partial crater collapse on Anak Krakatoa volcano is thought to have sent big waves smashing into the Sunda Strait almost without a warning, engulfing fishing villages and popular resorts along the coasts of western Java and southern Sumatra. 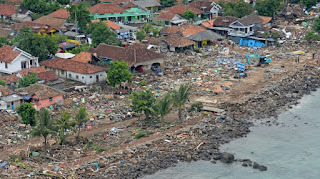 The confirmed death toll from the tsunami is 430 people, with at least 159 others missing. Almost 1,500 people have been injured and thousands more have been displaced. Indonesia, an archipelago of more than 17,000 islands with a population of some 260 million people, sits on the geologically active "Ring of Fire" and is frequently hit by earthquakes and tsunamis. Saturday's tsunami was Indonesia's third major natural disaster in just six months. In July and August, major earthquakes on Lombok island killed hundreds of people, while in September a devastating earthquake-tsunami claimed more than 2,000 lives in Palu on Sulawesi island, with thousands still missing.